Iceman surfing Kachemak Bay, Alaska during a cold winter sunrise. To break the ice for the season, here is a shot from 10 days ago out on the spit in Homer. There were some inside crushing tubes that I’ll post later, but this offshore boomer with iceman holds the dream and essence of surfing Alaska to me. Just one stoked surfer out there alone with the mountains and a swell on an unnamed break. Love it while you can, thirty minutes later that sand bar was almost out of the water with the ebbing tide. That’s fine though, iceman was probable ready for a soak in the hot tub, watching the swell, hoping it would stick around for another session before dark. Stay tuned and keep your fire burning, it’s blowing NorthWest at Augustine Volcano and the tide is flooding the bars. Good to see you back at it Scott. Great shot, makes me at least feel like I am back home. Good to see more photos from you. I’m always jealous of your backgrounds, and your foregrounds, and lack of crowds. Can’t wait to see more from this season. Hi Mcfish and Julian. Thanks, felt good to get a new post up here, and I hope it’s just the beginning for this season. The backgrounds . . they are awesome, I love them and I don’t think I take them for granted, at least I try not to. Hi Ken, can’t say that I recall our meeting. Not much for memory, guess that might be why I’m a photographer! 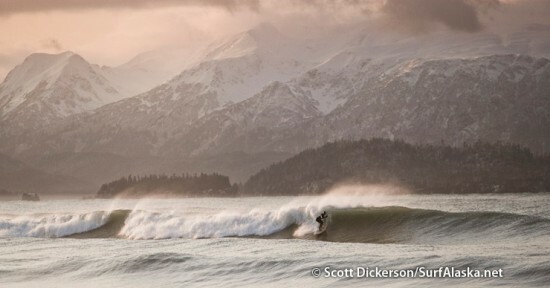 Where were you surfing in AK? got some tips to share with us here? Are you going to be in Homer? Hope to see you in the water sometime in the new year.